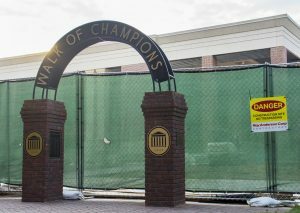 The Ole Miss Student Union’s almost four-year-long construction and renovation is set to be complete early in the 2019 spring semester. The project costs over $50 million and will include an additional expansion of 80,000 square feet to the already existing 98,000, according to a press release from University Communications. The union originally opened in 1977 to accommodate approximately 9,000 students, and there were nearly 21,000 students on campus in 2015, the year that the expansion project began. In July 2015, construction and expansion of the food court portion of the union began, and it opened in August 2017. The renovation portion of the union began in January 2017 and will be complete in early 2019, allowing nearly 178,000 square feet of food court, meeting space, lobby space and offices for students, faculty and staff to use. Construction forced the union to be completely closed to the public during the 2017 spring semester. During this time, no food court options were available to students. Students were able to eat at a mobile Chick-fil-A truck and Provisions on Demand truck in Galtney Lott Plaza, a mobile Dodo Pizza location in Weir Hall and other various dining locations on campus, such as the Rebel Market and the Grill at 1810. This temporary closure also forced many offices to relocate on campus. 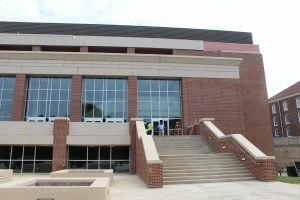 The Ole Miss Bookstore moved to the Jackson Avenue Center and the UM Box Office moved to the Ford Center. Many student-oriented offices, such as the Office of Leadership Advocacy and Fraternal Leadership and Learning, relocated to Minor Hall. All of these offices are currently still in their temporary locations, and most will move back to the union when it opens in 2019. The Barnes & Noble bookstore and coffee shop and the Mississippi Federal Credit Union will also return to the union, making it easier for students to purchase books and make bank transactions on campus. The union will also include additional meeting space for student organizations, including the Student Union Ballroom, which opened in spring 2018. Baker said other universities in the SEC are also undergoing union renovations. He said student unions at Kentucky and Tennessee are also slated to reopen around the same time as the Ole Miss Student Union.